IT’S BEEN THREE MONTHS since I’d last been in the Wind Rivers, and now, in the mid-December sunlight, snow sparkles around my skis like broken glass on the trail where there was only dirt months before. The aspens that looked so white in the summer are beige against the brilliant snow. 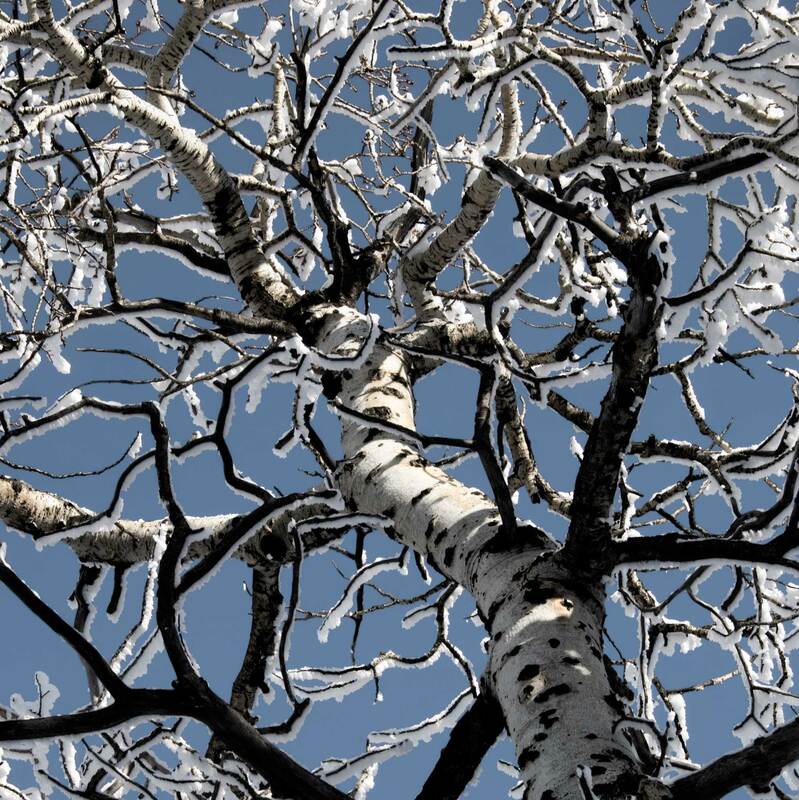 Eye-shaped black scars along their trunks, left by branches long since broken off, peer out into the winter sunshine. My friend, Heather, and I are skiing up a ridge near Elkhart Park; I’m in the lead breaking trail and a sweat. Each time I transfer my weight from one ski to the other the snow crunches and squeaks. I feel it settling beneath my feet, occasionally releasing a deep whump as the flakes and granules pack close together. This early season snow is still slightly unstable, not yet settled in for the winter, but where we are skiing is not steep enough to be concerned about avalanches. What’s strange about this scene is that it is wholly unfamiliar. Not the aspens or the lodgepole pine forest up ahead. Not spending a sunny day on skis with Heather. Not any one of these things individually, but the place. My goal was to know the Wind Rivers, but coming back here today I realize I don’t. As we kick and glide I point to sagebrush, turn to Heather and say “Artemisia tridentata.” She laughs, used to me spouting Latin she is only half interested in. I stop, smile stupidly and gesture toward the aspen, “Populus tremuloides.” I say it just to feel the words as they roll up my throat and over my tongue like ball bearings — smooth, slippery and uncontrollable. Latin plant names have always been like that for me; I cannot not say them. Even when my friends and family beg me to stop, their eyes tinged with insanity from hearing Mertensia, Abies, and Vaccinum, I can’t cease. The names tell a story of who is related to whom and how far down the evolutionary path one species diverged from its nearest relatives. But the sound is what really draws me: Ceanothus velutinus, Populus deltoides, Castilleja sulphurea. It is not just that Latin names make me feel smart, although they do, they also establish a familiarity and intimacy between the plant and me; they clear up the green blur. Most importantly, naming was my first attempt at knowing. And I can name most things in this range — the trees, shrubs and herbs, animals small and large, geologic formations, lakes, streams and glacier-carved peaks, even the vegetation and geologic history — but that’s not knowing. Heather is charitable and asks me about the rabbitbrush interspersed with the sage. “Chrysothamnus nauseosus” I tell her as we continue up the ridge. We glide out of the sagebrush-steppe and into the sun-dappled forest. The air is cooler and crisper here. At least winter is familiar — the slight stinging as my warm face meets cold air and the sloppy plops of snow dropping from tree limbs onto my head. I’m not the only one who names things. The Inuit of the Kobuk Valley in Alaska have a plethora of names for their nivean world. 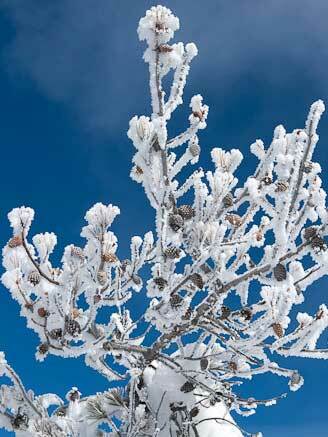 The snow that collects on trees is qali, the snow on the ground — api. Snow falling from the sky, delicate and bright, is called annui. The words are efficient and concise; they convey a sentence of meaning in just one word. But, the naming does not illustrate the feeling of swishing through the snow on skis, big crystals of ice sparkling from conifer branches and tiny squirrel prints looping around the base of trees. Appreciating the subtle beauty of a winter scene or the grandeur of towering granite is different than deeply connecting to a place. I think I rushed knowing the Winds. I tried too hard, like pushing commitment in a romantic relationship that isn’t ready for it yet. I expected the mountains to reveal something to me before I’d really done the work to deserve it. That’s not to say I didn’t gain anything from my time in these mountains. There’s the rush of going somewhere new, exploring and not knowing for sure what will be found. And the absolute delight in discovering fossils on an overturned river cobble or a perfect lavender harebell. The trail through the forest is uphill. It’s steep enough that Heather and I walk more than ski, putting extra emphasis on the camber of the skis as we push down the fish scales under our feet to grip the snow. Winter seems timeless, as if we are skiing through some other dimension. In spring and summer plants emerge, bloom and die, in fall leaves change color and drop from the trees — everything moves quickly — but winter is still. Snow covers granite and whortleberry, creating a hush across the landscape. Life still happens in the winter, but it is quieter, subtler, more economic. Instead of being squawked and chirped at by angry chipmunks in the trees, I notice tiny mouse prints in the snow, arrested by the indentations of bird wings, like fingers brushing the powdery api. Maybe part of knowing a place is associating the known parts with the unknown. I take the familiarity of winter, the ridges of snow building on thin branches, and use it to make this forest less foreign. If I already know the names of lodgepoles and aspens and can recite Latin like an incantation, maybe I’m ready for the next step in this relationship I want to have with the Wind Rivers. Heather and I don’t reach the top of anything, in fact we’ve ignored the map I’m carrying and don’t even know if there is a top to reach. After a few hours skiing uphill through the lodgepoles, we turn around. The descent is fast. Trees whip past me as I concentrate on making turns to avoid flying off the trail and into a tree trunk. Sliding down the hill, unable to focus on one thing, I feel like I’m speeding through time. I pop out of the forest and into the sagebrush steppe and wait half a minute for Heather to catch up. To the west, Half Moon Lake, dammed by a young, bald glacial moraine, reflects gray clouds gathering overhead. Beyond the lake sits the small town of Pinedale where we will stay tonight at the Teton Court Motel, and then the vast plain of the Green River Basin — where mountain men gathered at rendezvous to trade pelts, guns, alcohol and stories — spreads out beyond town. The Wyoming Range, gray and blunt in the distance, frames the scene. Later as I lay on my stomach on the motel room bed, head propped in my hands, staring past It’s a Wonderful Life on TV, I think about what it means to be truly connected to a place. I’ve heard some people say to know a place one has to work the land and be dependent on it for survival. I’ve never worked the land; I’ve never even had a garden. And while I’ve made my living by leading backpacking and caving trips, I don’t think it’s the same experience. When I think about places where I have a meaningful connection, the Sierra Nevada and Jackson and its environs spring to mind. What’s different about these places and the Wind Rivers is not my devotion to them or my ability to name their components, but rather the time I’ve spent there. To know a place is to experience it. The mountains don’t reveal themselves in a quick burst, but incrementally to those willing to take the time. I have to earn my relationship with the Wind Rivers and I haven’t done that yet. The morning after our ski, we load our gear in the back of Heather’s truck and drive to the end of the plowed road — about three miles before the Elkhart Park trailhead. The sun was bright and warm in Pinedale this morning, but now as Heather pulls the truck into a turnout, a mad wind whips through the trees. Hail-like snow batters the windshield and a low gray cloud encompasses the truck. Heather kills the engine, but we sit there for a while considering our next move. Our plan to ski up the road three miles and then along the Pole Creek Trail another four miles to Photographers Point doesn’t seem like much fun, given the weather. I consider that if my goal is to know the Wind Rivers, I should experience all faces of the range, even the cold, bitter side. I tell myself I don’t want to make Heather ski through 14 miles of storm, but the truth is I’m the one that doesn’t want to. So, when a woman skis down the road to the truck parked next to us and suggests we skip the skiing today because of the intensity of the weather, we decide to head back to Pinedale for chai and mint tea and sunshine. It’s hard to tell what the mountains are going to throw at me. It could be the delicate pink bloom of the bleeding heart flower, or it could be a wicked ice storm that pushes me back into town. Maybe I can never truly know this or any place, because the earth is not static and I am so temporary. And maybe the real lesson is in the learning.